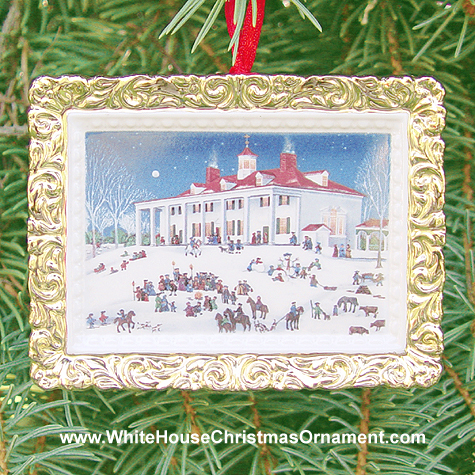 Limited Edition Ornament George Washington's Mount Vernon was always a warm and welcoming during the winter months. George Washington compared his home to a "well resorted tavern." This beautiful fine porcelain, 22-karat gold-plated brass finished ornament celebrates the warm spirit of Mount Vernon. Each ornament, adapted from a painting of the East Front of Mount Vernon by modern folk artist Carol Dyer, is numbered as part of a limited Year 2000 edition of 10,000 ornaments.